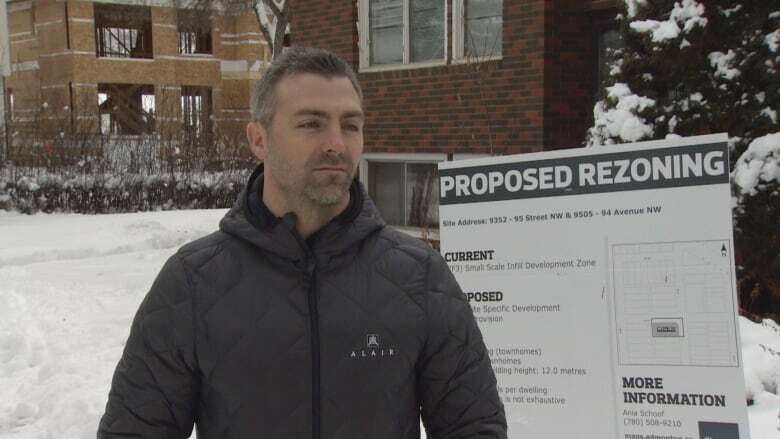 The City of Edmonton needs to come up with a plan to guide developers and encourage infill in specific locations, says a Bonnie Doon resident who is frustrated with the current rezoning process. "No government should work on an ad hoc, improvised manner," Edmund Aunger, a retired University of Alberta political science professor, told CBC News. 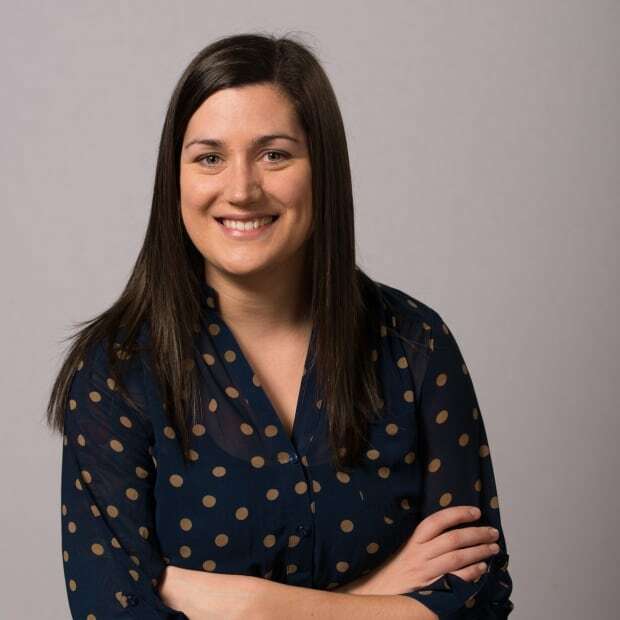 Aunger is critical of the way city administration considers each rezoning application individually before submitting a recommendation to city council, which has the final say. "The very first thing that the city has to do is have a zoning map that makes sense, that gives guidance to developers about where we want this higher density." A rezoning application is being considered for a property on Aunger's block, on the corner of 95th Street and 94th Avenue. The developer, Alair Homes, has submitted an application to build 10 townhouses on the site. The original proposal was for a three-storey structure, with 20 parking stalls. Current zoning only allows for eight units, with a two-storey limit. "The idea was to maximize the density," explained Graeme Bell, partner with Alair Homes. "We have to have that form of architecture in these areas because, ultimately, some areas are getting overpriced, and families just can't move in." Aunger, who lives across the back alley from the site, says the proposed building is too tall, and would have too much parking. He thinks it would encourage more residents to own vehicles instead of choosing to walk or use transit. "One of the reasons this area is so prized is that you can walk everywhere or ride your bicycle," Aunger said. "The idea is to get people out of their cars." After receiving feedback from the city and neighbourhood residents, Alair Homes is working on a modified version of its plans. The revised proposal would lower the height from 12 to nine metres, Bell said, and reduce the amount of parking. "We've actually started to bring the structure down so that it fits more into the mature neighbourhood overlay," he said. Public consultations will be held once Alair Homes is finished drafting the new concept, he said. Aunger wants the city to be more proactive in its planning, instead of granting exceptions to existing zoning bylaws. "The city should have a zoning plan that makes sense, that says to developers, 'If you want to put in a four-storey building or more, this is where we want them to go,' instead of basically sending out the message of, 'Do whatever you want, we'll give you an exception.'" The lack of planning leads to confusion for residents who live near an area that might get rezoned, Aunger said. "What kind of guidance are we giving to developers and residents?" Getting involved in the rezoning process is frustrating and time-consuming for residents, Aunger said. "It's absurd to expect the residents on their own to try to persuade the developer to respect the law." Andrew McLellan, a senior planner with the city, said the back-and-forth between the developer, the city and residents is part of the normal rezoning process. "If we identify things, based on our review, that we think should change, we'll give the developer the opportunity to do that," McLellan said. City planners consider many factors, such as the proximity to public transit, and whether or not the building is on the edge or in the heart of a neighbourhood. "All of that factors into our recommendation to city council," McLellan said. Aunger doesn't trust city council to reject an application that doesn't benefit the neighbourhood. He points to city figures showing that of 635 rezoning applications heard by city council between 2014 and 2017, only 11 were rejected. The six applications in Bonnie Doon during that time were approved. "My odds are not very good, and the odds in this neighbourhood are not very good," Aunger said. Many Edmonton neighbourhoods have a development plan in place, McLellan said, but Bonnie Doon is not among them. Urban planners are working on a municipal development plan that should be ready in May 2020. The City Plan, as it is called, will include guidelines around transit, density and land use, and will help reach the goals set out in Edmonton's Vision 2050 plan. "We need to get the broader city plan approved by council before we can get into the details," McLellan said. In the meantime, planners rely on documents like the city's guidelines on infill and transit to make their recommendations to city council. Builders and developers will benefit from having an overarching plan, Bell said. "It's always better to have a better understanding and more clarity on what would get approved and what would not get approved."